If one of your goals is to be more active this winter, hiking is the perfect outdoor activity. Why not include your dog in your plans? Exercise is crucial to your dog's physical and mental well-being. Unlike bears (and some humans!) dogs do not hibernate in the winter. A winter walk in the woods offers exercise and can be an excellent way to cure winter blues—with no worries about humidity or bugs! Going for a walk in the woods with your dog can be one of life’s great joys. 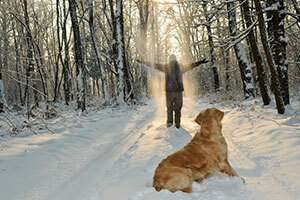 It just takes a little training effort on your part, and a willingness to see the woods from your dog’s point of view. Over the years, I have seen many “lost dog” signs, and met the occasional person in the parking lot whose dog has gone missing. Certainly, there’s an inherent risk in walking your dog off leash, in the woods or anywhere else. This article does not advocate for or against walking a dog off leash. Instead, the goal is to offer some advice on how to get more enjoyment out of the activity—especially if you find that your dog tends to wander off in the woods and does not pay much attention to you or the cues you’re giving him. The amount of attention your dog pays to you, in the woods or anywhere else, is usually contingent on where the dog’s reinforcement (the good stuff!) is coming from. If most of your dog’s reinforcement (novel smells, sights, and sounds) comes from the woods, the dog is going to be less apt to walk right next to you and more apt to wander a bit. If, instead, you ensure that a lot of the dog’s reinforcement (tasty treats, praise, games of tug, thrown toys) comes from YOU, chances are higher that the dog is going to pay more attention to you. There’s no rule that says you have to go into the woods empty-handed! Anything your dog finds reinforcing (tasty treats, tennis balls, tug toys, squeaky toys, etc.) is a tool for your arsenal. I don’t hesitate to use any of these reinforcers at any time. Yes, I sometimes look like a Crazy Dog Lady with a tug toy hanging off my neck, and a full treat pouch around my waist, but I’m in the woods. I don’t mind if the squirrels judge. It’s really not that much of a burden, and I’m happy that my dogs are happy to follow along with me. Pick your dog’s very favorite thing—a tennis ball, hot dogs, a tug toy, a stick, ANYTHING that your dog likes. The next time you head to the woods or the park, bring it and use it. The walk starts before the dogs get out of the car. It actually starts with how they get out of the car. If you open the rear door and allow the dogs to fling themselves out of the car with reckless abandon (a VERY common sight at dog parks), you can expect pandemonium in the parking lot! With my guys, nobody gets out of the car unless they’re first sitting with their leash secure and in my hand. They are then released one by one, usually according to which dog sat the fastest! Parking lots are dangerous places; parking lots at dog parks are even more dangerous. Cars and other dogs come and go. If someone else is letting their dog out at the same time, let them be first. Hold off a bit, and let the other person go first and get a bit down the trail before you let your dog out. When it is time to let your dog out, ask for a sit first. If the dog can’t gather enough self-control to give you that simple behavior, you can’t expect any self-control once the dog is actually in the park on a walk! It’s important to look at a walk in the woods through the dog’s eyes (or, more accurately, through his nose!). Dogs really do “see” with their noses. The very first thing my dogs do as they’re entering a trailhead is sniff the entrance with great vigor. Why? They are reading the news to see who has been there and when; were the visitors male or female, neutered or intact; how old were they; and more. If I were to pull the dogs away and hurry them along during that sniff-sniff-sniff-ing, I would be removing their chance to catch up on the day’s events. So, I let them have a good sniff around the entrance until they’re ready to move on. The forest itself is teeming with GREAT reinforcers for dogs, many of them olfactory. There are other dog smells, other animal smells, birds chirping, chipmunks scurrying, moss, leaves, sticks, grass, rocks, surfaces that go “crunch-crunch-crunch” under their feet, fallen branches to jump over, trees to run through, and so many other interesting reinforcers. Dogs find all of these sensory experiences very interesting and, as mere humans, it’s hard to compete with that. It’s not easy to be more interesting than deer poo! If you don’t make it worth their while, the last thing dogs want to do is “check in” with their owners. The smells in the forest activate the dogs’ SEEKING system—their desire to search for interesting things, to go exploring. This is the same system that’s at work for those of us who enjoy hunting for the perfect bargain. One great way to help your dog want to pay attention to you, their boring human, is to catch him “checking in” with you, even if it’s by accident, and pay him handsomely when he does. Click and treat your dog for checking in. What does checking in look like? Well, especially the initial stage, it looks different depending on the breed and the individual dog. If your dog is 100 yards out in front of you, checking in might be slowing down and half-glancing your way, as if to say, “What’s taking you so long, lady?” That counts! Click/treat. If your dog brings you a stick and asks you to throw it for him, that counts. Click/treat. If your dog happens to run toward your direction, even accidentally, that counts. Click/treat. For some dogs, checking in is a real effort. If the dog’s reinforcement history with the owner is lacking, checking in can be mildly annoying or even downright unpleasant. Do you have a dog that would much rather sniff the ground or run off than come when you call him? It’s a pretty common situation, but it can be turned around! Learn about more fun activities to do with your dog! Let’s say you win $1,000 to spend at the mall any way you like. As you arrive at the mall parking lot, you might start to anticipate all the stores you’ll shop at. 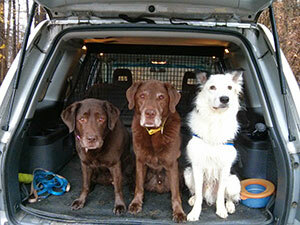 (Does anybody’s dog start pacing and whining when your car arrives at the trailhead?) You might have certain items on your mind that you hope to find, or certain stores you just know you’ll visit. For most of us, this would be an exciting adventure. Now, let’s say that just as you’re starting off on your shopping spree, your 8th grade math teacher (pick any subject or teacher you weren’t fond of!) suddenly appears and says, “Pop quiz!” Yikes. You were having so much fun and now you have to set that aside and take a pop quiz? Ugh. BUT, what if the math teacher explains to you that every time he appears and says “Pop quiz,” as long as you give him a high-five, you will get an extra $20 to spend and then you are free to go back to shopping? It might be a pain at first, but pretty quickly you will begin to anticipate and even hope for those “pop quizzes.” They are not so bad at all, actually! Now back to the woods with your dog. Often I hear pet owners calling their dogs, dogs that blissfully ignore them and go right on sniffing, running, and playing. So the owner will call the dog’s name more loudly, in an irritated tone this time. The dog continues to ignore the owner, and now cringes hearing its name. And so it goes. The dog is hearing, “Pop quiz!” Yuck. I’ll stay here sniffing, thank you very much. What if, when the dog gives you the slightest notion that he’s checking in with you, you click and give him a really tasty treat (say, liverwurst) and then immediately allow him to go right back to sniffing? And then you keep at it. Every time the dog checks in, even a little, you click and give him a treat. Little by little, checking in with you goes from being a pain to totally worth it. The dog still runs around and sniffs and enjoys himself, but you are much more interesting now. He wouldn’t dream of leaving without you, because you provide additional goodies for very little effort on his part. With these interactions, you are building a reinforcement history for being near you. When you have been paying your dog handsomely for a while, you may have a dog that is checking in with you SO much that you can’t get him to leave your side! Now what? First, congratulations on your accomplishment. You are the envy of thousands of pet owners! Second, you can now make treats contingent on something more. You don’t have to keep paying him every time he so much as glances in your direction. Maybe now you only pay him for several seconds of sustained eye contact. Maybe you start adding in requests for simple behaviors. Now, he must check in and respond to your request to sit, or lie down, or walk with you a few steps. Only then do you click and give him a treat. Jump over a fallen tree branch, run around a tree in a given direction on cue, place his two front feet on a tree stump and hold them there, jump up on a flat rock and lie down. Put your dog in a sit-stay while you go down the trail a ways, and then call him. Have him find a stick that you have touched amidst other sticks. Hide behind a tree and have your dog find you (my dogs LOVE this game!). It works better with two people. One person holds the dog, the other person hides and then calls out, “Where am I?” My dogs get soooo excited searching for their “lost” human (SEEKING system at work again!). I’m pretty sure the phrase “Where am I?” is stronger than their actual recall cue, because it has also been associated with the act of searching for me through this game. There are countless little games you can play with your dog in the woods. Let your creativity run wild. Enjoy the fact that you now have a dog you can take through the woods and not worry about him running off. 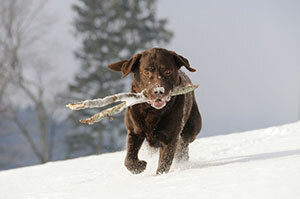 It’s great sensory enrichment for the dog, and great exercise for you. This article was based on a short activity called Take a Hike in Karen Pryor Academy’s Dog Trainer Foundations course. To learn about other fun activities to do with your dog, check out the Foundations course.